Isadora Pressley has a secret: she’s the host of a nationally-syndicated radio talk show called “My Foolish Heart.” Issy advises callers on their love lives; how to tell if this is “the one,” when to move on to the next fish in the sea, that sort of thing. The other residents of the town of Deep Haven have no idea Issy is a celebrity radio host, but that’s not the only thing she’s hiding ... Issy’s a fraud. She doesn’t date, learned all her romance wisdom from Jane Austen and Elizabeth Barrett Browning, and finds herself completely flustered when she tries to hold a conversation with an attractive man ... which is a bit of a problem, since one just moved in next door. That’s not Issy’s only issue. She suffers from agoraphobia, too terrified to venture far from the house she grew up in. She wasn’t always this way, but the horrific crash that took her mother’s life and left her father on a ventilator left Issy wounded in ways not always visible to the human eye. So she stays home, tends her garden, and—unknown to all but her best friend, Lucy—dispenses advice to the lovelorn from her bedroom studio. Issy’s new neighbor, Caleb Knight, has wounds of his own. He came back from Iraq with a prosthetic leg and hopes of becoming the local high school’s new football coach. Caleb’s a good, godly guy who would really like to get to know his pretty, skittish neighbor, he’s just not sure how to go about it. So when he tunes in early to his favorite sports show and catches the end of "My Foolish Heart," Caleb is desperate enough to think a little advice might be just the ticket. Caleb has no clue “Miss Foolish Heart” is actually the girl he’s trying to attract ... Issy has no idea that caller “BoyNextDoor” is, literally, next door ... and the fun begins. Woven through their story are the trials and tribulations of Issy’s friend Lucy “the donut girl” who is struggling to keep her family’s business alive while staying strong (and providing donut deliveries) for Issy. Lucy struggles with her past—and her past just moved back into town. Seb Brewster, former hometown hero football star, hopes to start over after some less-than-stellar choices after high school. Seb wants the coaching job Caleb is up for. He also wants Lucy, if she’ll have him. Whether she will is open to question. 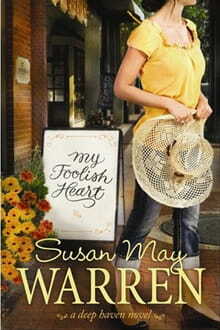 My Foolish Heart is a delightful visit to a charming town populated by real people who face everyday problems. The characters are well-rounded and believable; you’ll be rooting for all of them to win. Their dreams may be simple, but they’re no less real—and that’s part of their charm. It’s a story reminiscent of both Steel Magnolias and the Mitford novels, but with a personality and charm all its own. Take a trip to Deep Haven—you’ll have a wonderful time. Especially if it’s football season.